That’s what I was told this morning on my bus ride into New York City. Any other day, the man might have been referring to my appearance, but today he was talking about my watch. I was given one of the early review units of the new Pebble Time smartwatch and I’ve been testing the device’s new features for the last 48 hours or so. I was talking into the watch, using the voice-to-text feature, when my fellow commuter took notice and, well -- I’m sure I did look a little silly. However, not everyone who purchases a Pebble Time will look as silly, as the watch’s voice-to-text feature isn’t available to some users just yet. That could be a deal breaker for a lot of people, but more on that in a moment. To refresh your memory, Pebble Time smashed a couple of Kickstarter records earlier this year, becoming the most funded project as well as the fastest to reach the $1 million mark (it took just 49 minutes). Pretty impressive. Pebble Time ships today to its Kickstarter backers and should become available for pre-order on getpebble.com later next month. 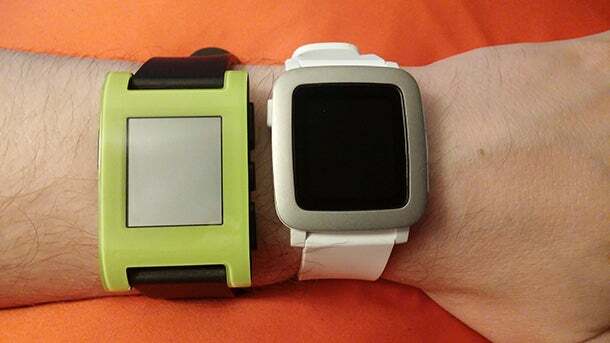 I’ve put the new Pebble through its paces, pairing it with Android and iOS phones. Also, I picked a couple of custom wristbands to try. Here’s more or less everything I’ve observed about the Pebble Time over the last two days. The new Pebble Time comes in three colors: black, red and white. I opted for the white version. First, you’ll notice the watch face’s rounded design. It lacks the boldness of the first Pebble, but in turn appears less masculine geek and more gender neutral. It looks great on my fiancée’s tiny wrist, for example. Pebble Time has a 1.25-inch display, compared to the 1.26-inch display on the first Pebble. It stands just 9.5mm tall on your wrist, though, which feels less clunky that the first Pebble at 11.5mm tall. Pebble Time has a stainless steel bezel, but you're left wishing the screen could be as large as the full watch face. Pebble relocated the magnetic charging port from the side to the back on the Pebble Time which, as you can imagine, is more aesthetically pleasing. 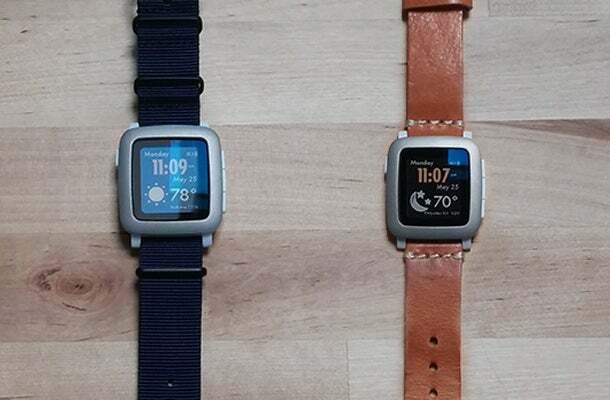 Pebble Time also will come in “Steel” versions, with either a stainless steel band or gold finish. While these higher-end editions look more fashionable, some might say Pebble Time doesn’t look as impressive as the Apple Watch or even the Moto 360. They might have a point, although I do really like the understated, sleek look of the standard Pebble Time. The microphone: The most notable and functional of the new features -- as far as I’m concerned -- is the watch’s built-in microphone. As the guy sitting next to me on the bus awkwardly learned, it allows wearers to record short voice-to-text messages in response to incoming texts and emails (the voice function doesn’t work for Gchats or missed calls). I tested the feature on an Android phone, in several environments ranging from a quiet office to a noisy bar. No matter where I was, the watch always understood what I said and never picked up what other people nearby were blabbering. If I’m walking down the street with my phone buried in my bag and I get a text, I can respond with a detailed and unique message without needing to handle the phone. Or, say, when I’m walking around the office without my phone, but within Bluetooth range. It also can help preserve your phone’s battery. You save power each time you respond to a message without using that power-sucking smartphone screen. Worth noting: You’ll need to enable Usage Logs within the Pebble Time app -- which sends diagnostic data to Pebble -- in order to enable the microphone. Pebble says the voice-recognition service that enables the voice-to-text feature uses the data to ensure that it "provides sufficient servers to meet Pebble's performance and accuracy requirements," the spokesperson says. New OS: Pebble Time has a new operating system called Timeline. It’s easy to use. When you hit either the top or bottom buttons on the right side of the watch, it opens a scrollable timeline of your activities and appointments. Pebble pulls this data from your calendar app, as long as you allow it permission to do so. Some of the graphics elsewhere within the OS are a little hokey, though. Color display: The Pebble Time has a color e-paper display with LED backlight. 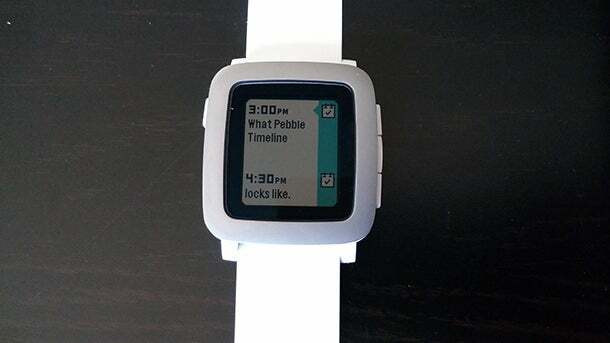 The original Pebble has a black-and-white pixel e-paper display. E-paper displays save on battery life, which is why the Pebble can last 5 to 7 days on a charge, while the Apple Watch with its full-color touch display lasts maybe a day. Even with color, the display is clearly visible in bright sunlight and doesn’t affect the battery. The color accents are nice, especially in apps and games -- if playing a game on such a tiny screen is appealing to you. It’s a work in progress. Pebble Time launches with some solid apps from partners including ESPN, Pandora, The Weather Channel, eBay and Evernote. As was the case with the first Pebble, there are many apps that are basically pointless. One I tried is the "Navy Blue Nato" canvas watchband. It feels and looks cheap. I’m not a fan. The other one Pebble sent was a beige “saddle leather” band. I didn’t love it at first but it grew on me. One might consider it a more fashionable option to the standard silicone band. Unlike other smartwatches, Pebble isn’t trying to create a phone experience on your wrist. At $199 (Pebble Time Steel will sell for $299), Pebble Time looks good and frees you from your smartphone -- just enough to make sense.